UPDATED (May 10, 2018) – North Courthouse Road will be closed between 14th Street N. and 15th Street N. from approximately 7:00 a.m. to 9:00 a.m. to accommodate the event. 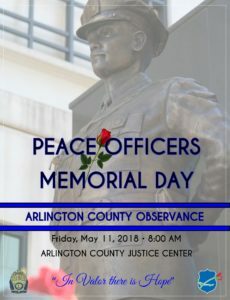 ARLINGTON, Va. – The Arlington County Police Department and the Arlington County Sheriff’s Office will gather to honor and pay tribute to the memory of the seven law enforcement officers of Arlington County who gave their lives in service to their community. 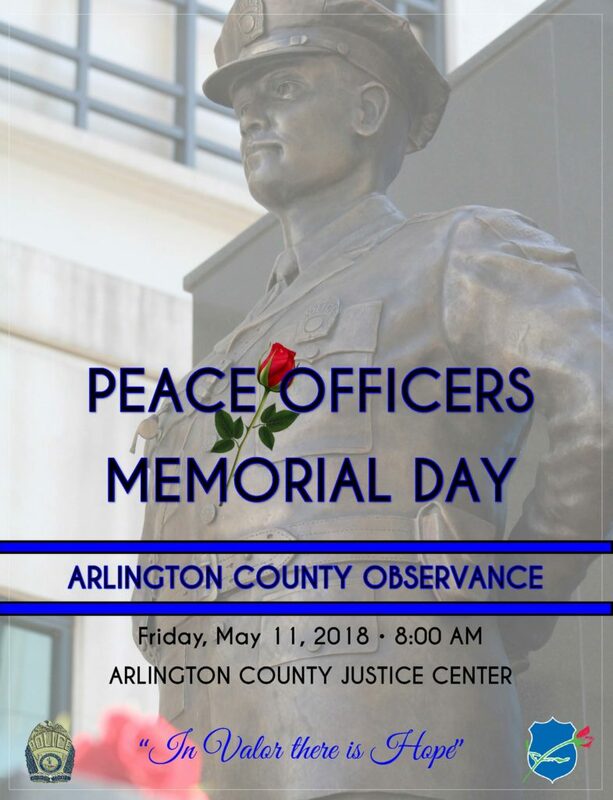 Media and the public are invited to participate in the Observance of Peace Officers Memorial Day on Friday, May 11, 2018 at 8:00 a.m. in the Arlington County Justice Center Plaza located at 1425 North Courthouse Road. The solemn ceremony is held each year ahead of National Police Week which recognizes those law enforcement officers throughout the United States who have lost their lives in the line of duty for the safety and protection of others and provides support to their survivors. To learn more about the sacrifice of Arlington County’s fallen officers, please visit our Hall of Honor.